Central Javanese by ethnicity, Widi S. Martodiharjo was born and raised in the bustling hill city of Bandung, once nicknamed the Paris of Java. There, he studied fine arts and design at Pasundan University. Martodiharjo’s career began as a photographer of jewelry and small objects during the day and as a graphic designer by night, creating layouts and illustrations for a variety of publications. The result of this period was a series of fantastic drawings of all sizes. Notably he limited himself to simple materials – brown paper, ballpoint pens, common pencils supplemented occasionally by a graphic ink pen and acrylic paint. The work shows a clear evolution from natural and anthropomorphic forms to an increasing penchant for abstract, almost mechanical ‘plants’. 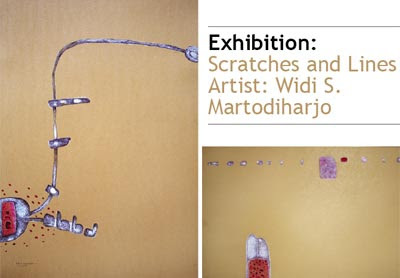 Exhibition opening: May 14 at 6:30 - 8 pm. Gallery opening hours: 9 am - 6 pm.